Outdoor Adventures Family is a participant in the Amazon Services LLC Associates Program, an affiliate advertising program designed to provide a means for sites to earn advertising and linking to Amazon.com. All links on this site may be affiliate links and should be considered as such. 7 Camping Tips for an Amazing Trip Even If The Weather Is Bad! Whether you are new to camping or you’ve got a few years under your belt, these 7 camping tips for a successful trip even if the weather is bad will ensure your camping season starts off on the right foot! Bring on those spring and summer months. So many amazing things start to happen when that weather begins to get a little warmer and more user-friendly. One of the best part parts of warmer weather? Camping trips! Going camping is so awesome. What better way to get out and enjoy nature than by taking a fun camping trip? Think about everything that makes you excited to camp. Nature, fun food, and great company…Sounds like a win to me! If you’re new to the camping world, or just need a few tips to help get prepared, here are some suggestions for tips on how to have an amazing camping trip. Book early. Yes, there is truth in the fact that there are some camping spots that are better than others. Don’t wait and miss out on the great ones! Pull up the campground map online and scope out what spot you think is going to be best for you and your crew. If you are wanting a spot near the water, or the woods, plan accordingly and then book it. The longer you delay, the chance you run of that spot being taken by someone else. Secure that spot! Have everyone make a wish list. Part of camping fun is also allowing a little bit of indulgence here and there as well. Have each person in your family make a wish list of fun things that they would like to take or have while camping. Some favorites that tend to top the lists? S’mores, kettle chips and some good ol’ hot dogs. Truth is that anything cooked over the campfire just tastes awesome. Bring on that campfire cooking! Speaking of how awesome food tastes over the campfire….try out some fun new recipes that you’ve been wanting to. 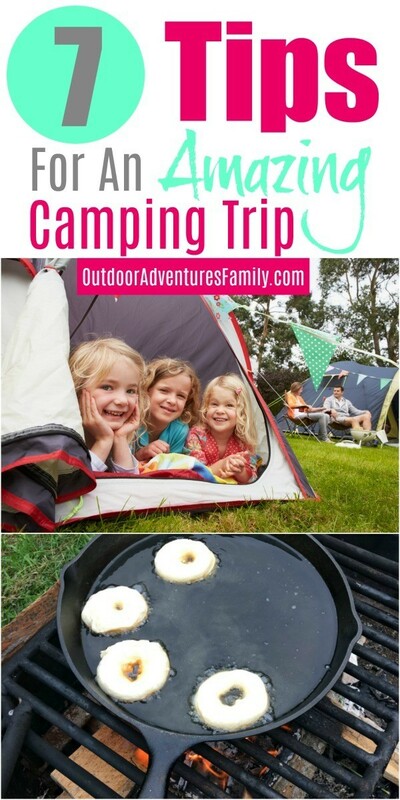 Create nachos over the campfire or use that cast iron skillet to cook up some yummy campfire donuts. If you want to stay on the healthier track, veggies are super yummy over the campfire as well! Have fun creating and then eating that delicious food. Plan for the weather. Don’t let a little rain deter you from taking that planned trip. Just be prepared. If the weekend is calling for a little rain, make certain to stock up on books and magazines to read and games to play. Tents can be waterproof and think of the possibilities of creating a warm and snuggly reading nook to lay in all day, listening to the drops of rain. Perfect weather isn’t required to enjoy camping. Embrace mother nature and enjoy! Pack that bug spray! While it may not sound like something fun necessarily, you will be so happy to have been protected from the bites of those pesky mosquitos. Don’t spend your camping trip itching away. Pack that bug spray and itch relief cream to help you be comfortable in case. Don’t forget the tick repellent too (for dogs and humans!). Unplug. Yes, totally try to unplug from the outside world. Part of the beauty of camping is to be able to relax, spend time with family and friends and enjoy being in nature. However, you can do it, unplug. Leave the phone in the car, leave the laptop at home and leave the electronics home alone for a weekend of their own. Leaving those outsides stresses and distractions of the world can be very freeing! Sit by the campfire and chill. Some of the best conversations can start flowing around the magic hue of the campfire. The chill in the air coupled with the warm fire creates an ambiance that is extremely inviting and invigorating. Allow yourself to snuggle up next to the fire and just be in the moment. Listen to the conversations, the sounds of nature and the crackling of the campfire. It’s mystical and magical, and a must-have for any camping adventure. Camping trips can be absolutely amazing. Think of the possibilities of nature hikes, yummy food, and amazing company. Embrace all that camping has to offer and explore other fun possibilities along the way. Camping can be customizable to whatever fits the needs of you and your family. Bottom line? Camping time is an amazing time for family time. Take that trip and enjoy one another! Sarah lives in Minnesota with her husband and four children. She enjoys going on outdoor family adventures including camping, dirt biking, boating and whatever crazy, new adventures her husband, David, has thought up! She believes life should be filled with fun opportunities to make memories as a family and aims to inspire you to do just that!